It was twenty years back. She must’ve been sixty something at that time. Yet, her body as slender as string beans and skin, shiny as a new leaf. Even at that age, her barely salt and pepper hair, still lustrous and thick as a jungle, came flowing down to her thighs. Every time I think of what greens can do, weirdest of all, an automatic mental flashback picture of her, greedily devouring a bowl of steamed greens daily, hits me. For whatever reasons I might not have liked my paternal grandmother much growing up, I’ve always liked my greens. Ever since I’ve lived away from home, with my love for greens, I’ve lived on an overdose of spinach, fenugreek, dill and the occasional Amaranth (when I get lucky). No offence to any of those, I still love them enough to enjoy them in a host of dishes like Palak Pappu, Swiss Dal Paanch Phoron, Nalgari Aloo Palak or Methi Pudina Pachadi. Every once in a while whenever I felt the urge to break free from the “greens rut”, I gladly embraced one new-to-me green after another, swiss chard, red chard, mustard greens, beet greens or even kale, but yet to warm up to a lot many. Like for instance, the watercress. Though I’ve known for sometime that this unpretentious and most often unnoticeable in the grocery stores “Watercress” is a potent cancer fighting and asthma curing medicinal super food, even my ever-so-presumed-to-be broad palette found its “grassy-ness” overpowering enough to quit after the first couple of buys. This time, I wasn’t ready to quit. Albeit, I could somehow hold my nose and gulp it down (exaggerating of course), I had to get it through to him and my little obnoxious food critic. Cauliflower and any broccoli look-a-like is my little girl’s favorite and paanch phoron happens to be mine lately. So, there was little to risk, after all. You think I corrected her? I’m told that most typical watercress bunches available in stores are likely to be harvested from around streams, their natural habitat. But, on a lucky day or at a whole foods market, one might find a delicate living version of this green with roots intact in a tiny blob of soil, sitting pretty in a bloated plastic package, carrying a nifty name “hydroponic watercress”. I was indeed super thrilled when I bought this dainty thing one time, but honestly, I’d prefer the hollow stems, thick dark green leaves of the conventionally grown, any day, even if it is bruised by handling. Watercress apparently is called Jal Kumbhi in Hindi. I’d like to think I have seen quite a few greens other than the routine spinach and methi, but don’t know for what reason, I have no memory of encountering this green ever in India. If you know what it is called in Kannada, I’m curious to know..
Also, how do you cook Watercress? 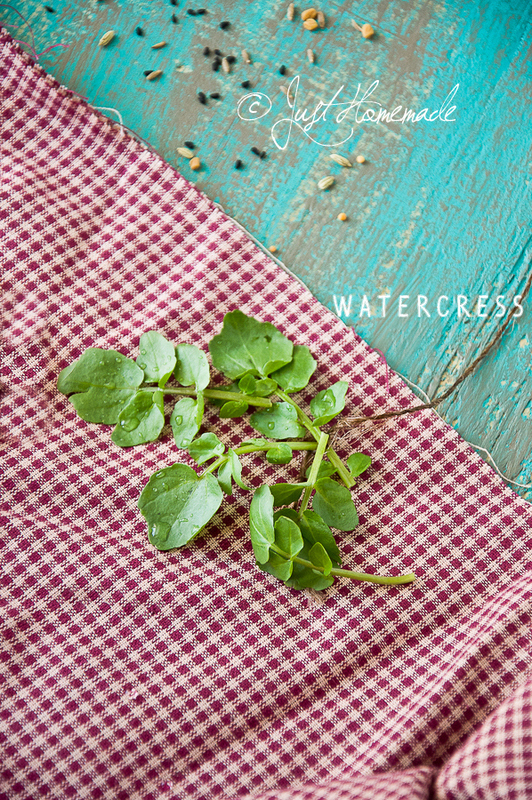 Wash watercress bunch well in a large bowl of water with a tsp of baking soda. Rinse well in few more changes of water. Drain well and pinch off the leaf sprigs (as seen in the picture above) leaving out the thicker stalk. Delicate stem can be used chopped. 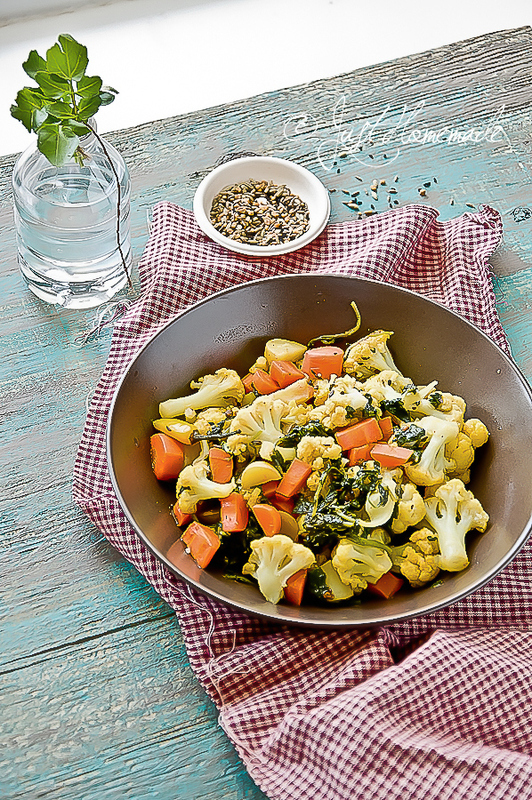 Make sure that cauliflower florets are well drained. Heat oil in a large pot over medium high heat. when the oil is hot enough or shimmering, add paanch phoron. When the seeds start crackling, add green chilli halves, cumin powder, quickly followed by turmeric and and sauté until green chillies show white spots. Add diced potatoes, carrots and cauliflower florets and sauté for a bit. Cook covered until carrots and potatoes are semi soft. Add watercress leaves, salt, red chilli powder, amchur and give it a good stir. Cook covered for a few more minutes until the watercress leaves are wilted and check if veggies are cooked. Serve hot with chapathi, roti, rice of your choice. To make paanch phoron yourself, just mix equal portions of white mustard, fenugreek, fennel, nigella and cumin seeds. If you have plants, just spread the shredded watercress stalks and carrot peels into the pot instead of discarding. I re-purposed them for my curry leaf plant. Thanks so much. I’ve been considering watercress, now I know a good way to use it! This looks just so wonderful! I simply must make this – I love watercress, and what a gorgeous combo! Is it telepathy? ‘Cos whenever I think of you, I see you here.. Awesome! Glad you like it.. Never occurred to me earlier either! Just stumbled on it, not wanting to eat it raw.. This looks yummy!!! Never tried Watercress….definitely gonna try…. Praveena, Do you know its Kannada name? Nice way to use greens. I do not know if we get watercress in the local store in India. But I do recollect seeing leaves like this sometime. I’m quite sure Watercress would not have escaped Indian cuisine. If only I could get someone who has seen it and cooked it to say that! Thank you Rosh & Spandana..
People say it has a peppery flavor, I feel it has more of a grassy note.. We can sure eat it in a tasty curry, all in the name of good health, can’t we? Wonderful combination. I’ve never heard the medicinal value of watercress before. Thanks for sharing this! 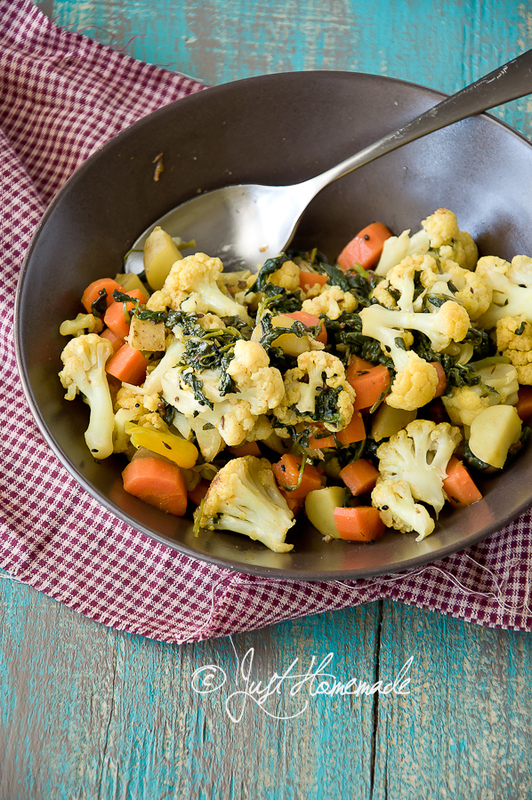 adore the simplicity and gorgeous flavor of this recipe and your photographs! watercress can be spinach as long as they eat 🙂 and eat becoz they love it!! I just saw this on RecipeNewZ. What a wonderful recipe! 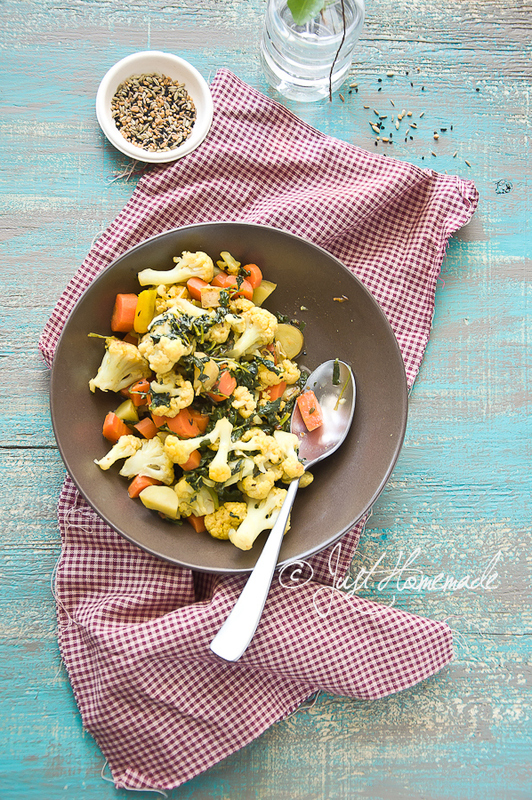 If I had cauliflower at home, I would be making it for lunch today… Such hearty flavors – love it! And the photographs are gorgeous! Hi Radhika, is watercress available in India?..if yes, where is it available in Bangalore?..pls let me know..
Yum! Definitely going to try this! Where can I find Watercress in India ?